It turned heads at the first postware London Motor Show in 1948. Blew the competition away at England's legendary Silverstone race track. So when after years of secret development, after the first Jaguarl XK120 roadster rolled off the fabled Coventy assembly line, there was no doubt that a new generation of motorcars was born. 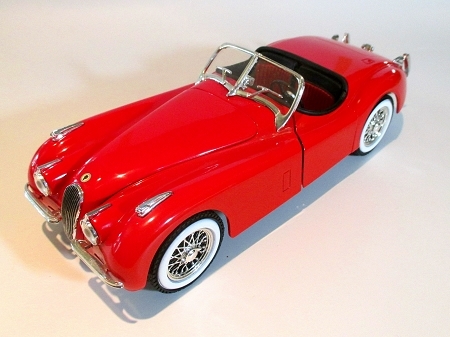 This is a brand new, unopened, factory sealed box containing one red die cast metal model of a Jaguar 1948 XK 120. Made by Ertl and Authenticated by Hamilton.